Beat This Caption Contest 226 Winner – Caption Contest Funny Clever Witty Enter Today! 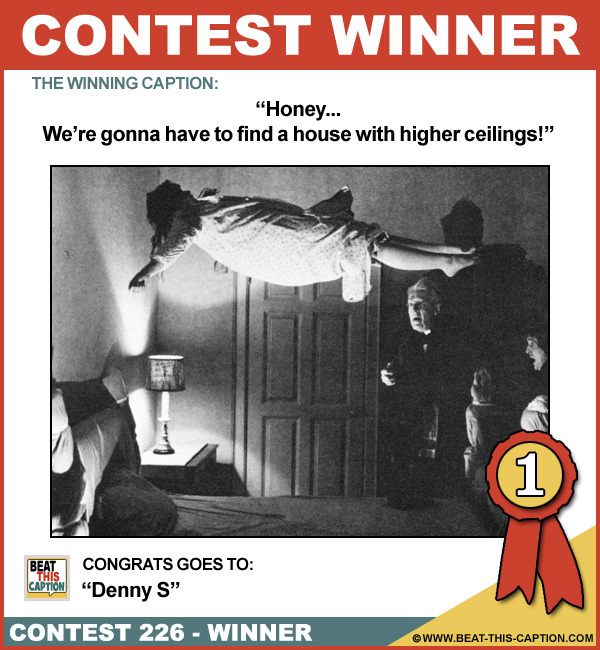 Honey…We’re gonna have to find a house with higher ceilings! It looks like someone put a whole roll of quarters in the motel’s “Magic Fingers Massage” machine! Houdini’s bunk bed: he had the lower and his wife, the upper! Let’s get her down first, and then we’ll try and cure her flatulence! Maybe you should just try sleeping on your belly after eating at TacoBell! By God it is true…the Devil does wear Prada!